What are the benefits of virtual offices for start-ups? BlogWhat are the benefits of virtual offices for start-ups? Starting or operating a business costs money no matter how you look at it. You need to hire people, and you might need to invest in technology or pay to manufacture a product. But there are some costs, such as expensive rent for office space, that you can forgo. There are many benefits of virtual offices for start-ups or small businesses. The first thing you should do when setting up a virtual office is to make sure your virtual operation looks and sounds like a well-established company to potential clients and other outsiders. You should invest in a dedicated local phone number, a local fax number and establish a corporate mailing address. You should also consider setting up customized voicemail boxes for your employees, and you might even hire a live receptionist who can answer and route calls from anywhere. You can put together the technology and software solutions you want yourself, or you can fully leverage the benefits of virtual offices by investing in a pre-packaged virtual office business solution. What are the benefits of virtual offices? The biggest cost savings that start-ups and small businesses realize from virtual offices comes in reduced overhead expenses such as rent for office space, utility payments and IT costs, including purchasing and maintaining equipment. For a startup or small business, these cost-savings from virtual offices can be the difference between taking off and going broke. The money you save can be passed on to the clients or reinvested in human capital. Think of the time that it takes you or your employees to commute into the office. Not to mention the time it takes to get ready to go to work in an office with a bunch of other people. Now imagine you had all that time to work instead. You’d probably get a lot more done, wouldn’t you? A virtual office where employees have more control over their schedule also means they use fewer vacation days. For example, parents who want to attend an event at their child’s school in the middle of the day can just make up the time later instead of taking a half-day or whole day off to accommodate their family needs. Have to make a trip to the doctor or dentist? Want to hit the gym? A virtual office lets employees do what they want on their own schedule and still get their work done on time. In the traditional, in-person office structure, the focus is on whether or not a person is at their desk for the required number of hours a day. But just because someone is sitting at their desk doesn’t mean they are being productive. In fact, sometimes the opposite is true. 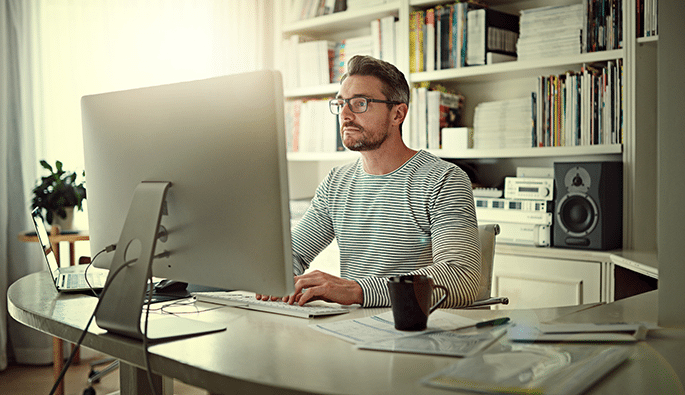 Disciplined employees working from a virtual office are often more productive than their desk-bound counterparts because they are more focused on meeting goals instead of just logging hours. Employers can also quickly see who the top performers are because a virtual worker doesn’t have someone in the next cubicle over to bail them out if they make a mistake or miss a deadline. Every business wants to attract and retain top talent, but for start-ups or small businesses tied to a physical location, relocating the people you want to where you are is probably a financial deal-breaker. With a virtual office, you don’t have to worry about relocation costs. If the person is a match, their first day can be at their home office. With this flexibility, you can quickly expand your workforce to meet increased demand while cutting certain expenses. Have one client in Tokyo and another in London? That’s not a problem – if you have a virtual office. It’s easy to assign remote employees to work hours that line up with or overlap with international time zones. Or perhaps it makes sense for your company to send a few employees overseas but you can still leverage the benefits of a virtual office by having them work from home except when they need to be face-to-face with an international client. Despite the many benefits of virtual offices, they are not an optimal or workable solution for every company. Your particular business may require in-person interaction for employees or clients, but there are still ways to experience some of the benefits of virtual offices in a brick-and-mortar space. One of the easiest and most effective ways is to incorporate huddle rooms and other less formal meeting areas into your office space. Especially when equipped with the right collaboration technology, huddle rooms can be a bridge between the virtual and in-person and can provide the flexibility employees crave.